Humans, trolls, bad governments and parallel worlds: Pratchett and Baxter offer a rich cast of characters and provocative ideas in their latest novel. There is so much going on in this sequel to The Long Earth that it is a wonder the authors can hold it together. Of course, they are both extremely skilled and experienced writers, and are both, it would seem, enjoying the process. But in this book there are talking beagles, kobolds, references to the brutality of humanity-first ideologies, Tibetan monks, singing trolls, very, very assertive women and even a reference to jumping the shark. There are space-travel projects and a resuscitated nun. And that is certainly not all. However, although this may sound overwhelming, the novel offers us a fabulous kaleidoscope of possibility; a rich example of truly speculative fiction. In this book, the possibility of stepping between the myriad parallel earths has existed for 25 years and so much that was new and challenging in The Long Earth, and which took a certain amount of explaining, can now be taken for granted. Yes, there are millions of earths which can be visited and exploited by humans, using their steppers – each one powered by a potato – and the mysterious Black Consortium has made a great deal of technical infrastructure available, so that there are airships called twains which can cross an earth in a second. But now the authors are looking at what things can go wrong as well as what surprises may lurk on these many worlds. The main narrative deals with the attempt by the President of the American Government in Datum Earth (the one we know) to impose its rule – the US Aegis – on the many new settlements on other earths. He sends out several twains, including one called the Benjamin Franklin commanded by Maggie Kaufman on a non-punitive mission, to coerce the outer settlements into doing things his way. One such settlement, Valhalla, is refusing to obey the American Datum Earth’s desire to collect taxes. There is definitely an implied critique of domineering and tyranical governments in this narrative thread. Mixed in with this exploration of overweening military power is the examination of the casually brutal treatment of the trolls, who are often used as slave labour on many of the settlements and not considered to be sentient creatures. Trolls have their own way of communicating – the long call, which seems to be able to reach all the earths – and they are reacting in unexpected ways to the often cruel behaviours of humans. Meaning every troll everywhere would soon know all about this. Even though this mission of the twains, with its potential for devastating conflict and destruction of the trolls, is the main narrative trajectory, there are so many other stories that its significance fades. For example, there is the exploratory Chinese mission with the extremely brilliant 15-year-old Roberta on board; then there is the story of the Indigenous Australian Thomas Kyangu and his discovery of special cave paintings (Pratchett has a soft spot for Australia). There are very many characters, each with a little story that illustrates some aspect or outcome of the extraordinary discovery of parallel worlds. Every one of these characters is presented by the authors with a great deal of individuality, although not much depth. Don’t look here for involved character development. 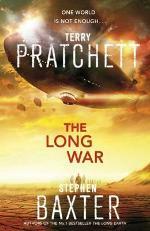 If I were to speculate about which aspects of the story belong to which author, I would say that Baxter would certainly be providing many of the imaginative ideas, but I think that the affectionate tone and warmth with which the characters and their conversations are treated is very Pratchett. The questions that they pose are very much to do with aspects of human behaviour: What would humans do in the face of such freedoms? Would the usual sins of greed and lack of empathy prevail? Would we make the same messes? Would green solutions be good enough? These books are a compendium of imagined processes and outcomes, and they are a great deal of fun, really engaging and thought-provoking. There will undoubtedly be more.